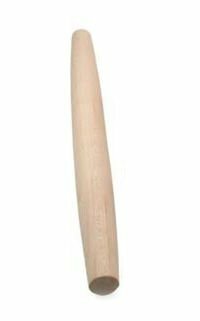 Roll dough for desserts with this JK Adams French rolling dowel. Made from wood, it features a thinner barrel for a finer pin. Tapered ends allow for easier rotation when rolling. Made in the USA, this is the perfect rolling pin to use for pies, tarts, cookie dough, and more.